Mark Barron is an American football player. He is a linebacker. He is currently a free agent. Tampa Bay Buccaneers selected him as a strong safety in the first round of the 2012 NFL Draft. He then moved to St. Louis Rams in 2014. He played college football at Alabama, where he was twice recognized as an All-American and was also a member of two BCS National Championship teams. As if 2018, he has recorded 628 total tackles, 9 sacks, 5 forced fumbles, 3 fumble recoveries, and 8 interceptions. 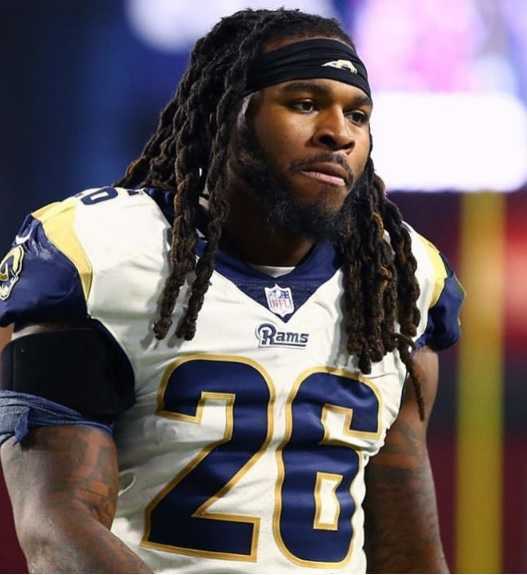 Mark Barron, who became a free agent after the Rams released him on 5 March 2019, it is reported that the Pittsburgh Steelers has reportedly signed a 2-year deal with Mark Barron worth $12 million. The 29-year old linebacker is expected to be a suitable linebacker to replace Ryan Shazier, who suffered a horrible injury late during the 2017 season. The Steelers has always acknowledged that the team has suffered Shazier's absence. Originally a safety, drafted by the Buccaneers in the 2012 NFL draft has recorded 628 total tackles, 9 sacks, 5 forced fumbles, 3 fumble recoveries, and 8 interceptions in his NFL career since 2012. He is a two times an All-American and SEC champion in 2009. Twice recognized as All-American and was a member of two BCS National Championship teams while at Alabama. 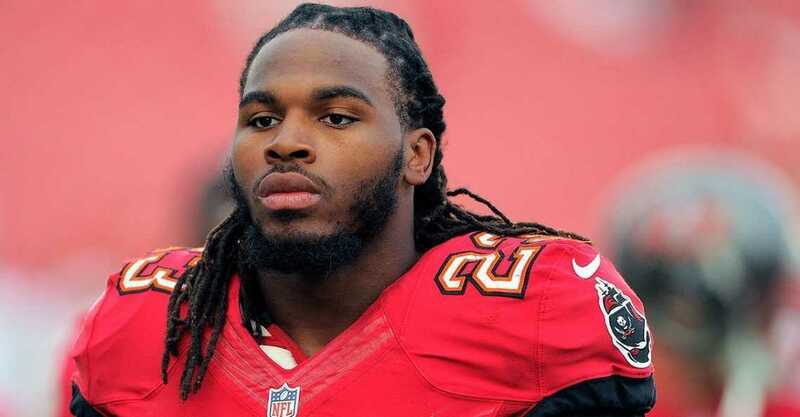 Mark Barron was born on 27 October 1989. His birthplace is in Mobile, Alabama in the United States. He holds American nationality. Detail information about his parents and early life is not available. His zodiac sign is Scorpio. He attended St. Paul's Episcopal School in mobile, where he played high school football. At high school, he played multiple positions including running back, wide receiver, and linebacker. He recorded 785 rushing yards on 78 carries, 368 receiving yards on 23 catches, and 12 touchdowns as a junior. As a senior, he recorded 1,094 rushing yards on 122 carries and 15 touchdowns. He was named the MVP of the 2007 Class 5A state championship game. He has also named a first-team Alabama Sports Writers Association All-State selection in Class 5A as a senior. He also competed in track & field winning 5A individual state titles in events ranging from the shot put to the long jump. He has recorded a career-best throw of 17.09 meters in the shot put at the Mobile Challenge of Champions. He won four state titles, triple jump (14.08 m), long jump (6.74 m), discus throw (44.03 m), and shot put (16.76 m) at the 2008 AHSAA 4A-6A Championships. He also recorded a personal-best time of 11.39 seconds in the 100 meters. Scout.com ranked him as a five-star prospect and the number one weakside linebacker in the Class of 2008. Rivals.com ranked him as the fifth best player in the state of Alabama and the 55th best player in the nation in the Class of 2008. Despite offers from Auburn, LSU, Florida, Florida State, Tennessee among others, he committed to play at the University of Alabama. Barron enrolled at the University of Alabama with an athletic scholarship, where he played for the Alabama Crimson Tide football team. He recorded 18 tackles and a sack in his freshman year. He was recognized as a first-team All-SEC selection and third-team All-American at safety in his sophomore year. He finished his junior year at Alabama with 77 tackles, 3 interceptions, 9 passes defended, and 1 forced fumble. He was named to FWAA All-American in 2010 season. In his senior year, he was again a first-team All-SEC selection and was also recognized as a unanimous first-team All-American. It was his second All-American selection. He attended the NFL Combine in Indianapolis. However, he did not perform drills as he was still recovering after recently undergoing sports hernia surgery. He attended Alabama's pro day in March 2012 and performed the majority of drills except for the short shuttle, three-cone drill, and bench press. At the conclusion of the pre-draft process, NFL drafts experts and scouts projected him to be a first-round pick. DraftScout.com ranked him as the best strong safety prospect, whereas NFL analysts Mike Mayock, Charley Casserly, and Sporting News ranked him as the top safety. Tampa Bay Buccaneers selected him with the 7th overall pick in the first round of the 2012 NFL Draft, making him the highest selected Alabama defensive back in school history, surpassing Antonio Langham who was chosen 9th overall in 1994. He signed a four-year deal worth $14.56 million with a signing bonus and no offset language of $9 million in July 2012. He made his professional regular season debut in the Buccaneers' season-opening victory over the Carolina Panthers. He recorded 3 solo tackles, and 2 pass deflections is his debut game. He recorded 71 solo tackles, 17 assisted tackles, 10 pass deflections, 1 interception, and 1 forced fumble in his rookie NFL season. He was named to the Pro Football Writers Association All-Rookie team. He finished his second season with the Buccaneers with 88 combined tackles, 6 pass deflections, 2 sacks, and 2 interceptions in 14 games. He finished his tenure at the Buccaneers with 225 combined tackles, 18 pass deflections, 3 interceptions, 2 sacks, and 1 forced fumble in 38 games in 3 seasons. The Buccaneers surprisingly traded Barron to the St. Louis Rams in October 2014 for a fourth and sixth-round draft pick in the 2015 NFL draft. He said he felt disrespected and blindsided by the trade. It was reported that he was traded for his unprofessional behavior. He recorded 23 combined tackles, 3 sacks, and 1 pass deflection in remaining of the 2014 season after being traded to the Rams. In May 2015, St Louis Rams declined to pick up his fifth year, $8.26 million option on his rookie contract. He has named the backup to McDonald to begin the regular 2015 season. he finished the 2015 season with 116 combined tackles, 1 sack, 5 pass deflections, and a career-high 3 forced fumbles. He appeared in all 16 games starting in 12 games. Barron signed a 5-year deal with the Rams in March 2016 for $45 million with $20 million guaranteed and a signing bonus of $5 million. He returned as the Ram's hybrid weakside linebacker for the 2016 season. He recorded 119 combined tackles with 91 solo tackles, 8 pass deflections, 2 interceptions, and 1 sack in 2016 season. He finished the 2017 season with 86 combined tackles with 73 solo tackles, 4 pass deflections, 3 interceptions, and 1 sack in 15 games and 14 starts. The Los Angeles Rams finished first in the NFC West with an 11-5 record and qualified for the playoffs. He started in his first career playoff game recording 10 combined tackles with 8 solo tackles in a 26-13 loss to the Atlanta Falcons in the NFC Wildcard game. He recorded 60 combined tackles, 1 quarterback hit, 1 pass defense, 1 forced fumbles, and 1 sack in 2018 season, starting in 12 games. The Rams won the NFC West earning #2 seed for the NFC Playoffs. He recorded 5 combined tackles in the victory over the Dallas Cowboys in the Divisional Round. He recorded 9 combined tackles in the victory over the New Orleans Saints, in NFC Championship. He recorded 8 combined tackles and 1 pass defense in the 13-3 loss to the New England Patriots in Super Bowl LIII. The Rams released Barron on 5 March 2019. Pittsburgh Steelers reportedly signed Barron on a 2-year contract worth $12 million on 17 March 2019.
Who is Mark Barron Dating? 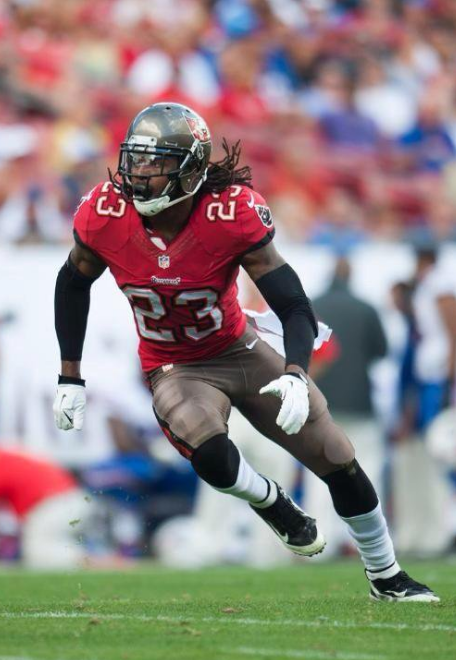 Mark Barron is reportedly single. He might be dating someone. However, no rumors regarding his affairs have surfaced yet. He has maintained a low profile regarding his personal life. What are Mark Barron's Body Measurements? Mark Barron stands at a height of 1.88 m i.e. 6 feet and 2 inches tall. He has a body weight of 104 lbs i.e. 230 kg. He has a listed arm length of 0.85 m and hand size of 0.24 m. He has an athletic body build. 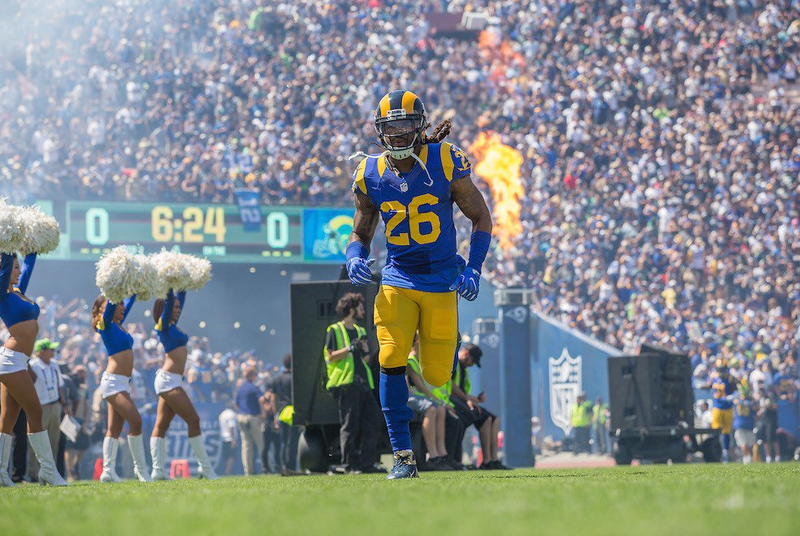 What is Mark Barron's Net Worth? Playing football is his main source of income. He earnings come from salary, bonuses, and endorsement deals if any. The Buccaneers signed him for $14.56 million with a $9 million signing bonus. The Rams signed a five-year deal worth $45 million with $20 million guaranteed and a signing bonus of $5 million. He has reportedly joined the Pittsburgh Steelers for $12 million in 2019. As of 2019, his net worth is under evaluation.